With Chicago, Tufts, and the BAA half in the rearview mirror, Fall is officially here. Congrats to those that went out on the road and reached out for their goals. I hear Chicago was a hot one, just another challenge along the way. For those still training, this is the last week of the fall edition of the 2017 Sunday Long Run. A good year of strong training and great companionship on the roads. Let’s go one more week and finish this off. We’ll start up Main Street, turning left on Melrose Street and left again onto the LynnFells. Follow that up past Grimsby’s, through the Fellsway East hills and turn right on Highland Ave. There you will find water stop 1. After that, surprise! You’re running counterclockwise around Spot Pond. Go straight through the rotary past the hockey rink. If you’re running short you’ll peel off at Pond Street, down to Grimsby’s, straight onto West Wyoming, and left on Main to finish your season off. If you’re running long continue straight past the Stone Zoo, turning left into the Straw Point parking lot, and left when you leave the parking lot. Follow this over I93 (don’t go down the off ramp or you’ll be on I93!) and past the sheepfold, under I93 up to a left on Elm Street. Run up Elm back to the rotary and turn right onto Highland Ave for water stop 2. After this water stop continue a little on Highland and turn left on East Border Road. Run up that stretch and turn left at the lights back on to the Fellsway East. Through those hills to Grimsby’s, turn right on West Wyoming, left on Main and then the Sunday Long Run is over for this year. Lois will usher you around the route with fantastic water stops and shut out the lights on this year’s SLR when you’re done. Thanks again to Lois for her efforts to bring this season to a close. I appreciate it very much. Good luck on all your races yet to happen. You’ve all trained hard, here’s to great runs in your future. If your mouth is full of pasta as you read this, there’s a good chance you’re in Chicago getting ready for your big day. It was a pleasure working with you to get to the starting line, now its up to you to get to the finish line. Go get there! If you’re not eating pasta yet, you’re likely starting your taper for Baystate or one of the many half marathons coming up in the next few weeks. To you I say step carefully, don’t do anything stupid, your big day is coming up soon. If you’re doing New York or Philly, well keep on running, you have a ways to go still. Last week I’m sure was awesome as Lois, Pam, and Dan got you through your miles. Once again you’re in the capable hands of Lois to get you through another week. 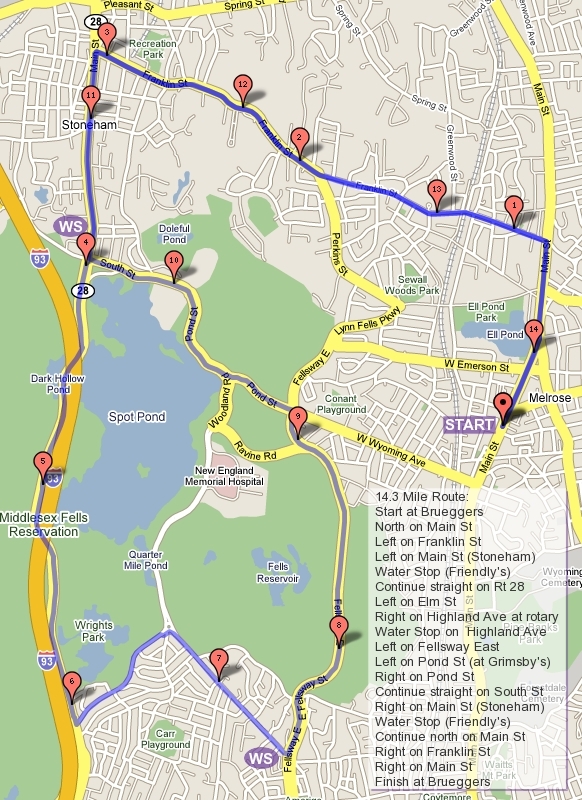 The route will take you to Swain’s Pond and out to Farm Street if you’re running long. If you need more detail than that, look at the map. Water Stops. I’m sure there will be some, right Lois?